For centuries, man had attempted to harness the mechanical power of heat and water. As early as 200 BC, in his Pneumatica, Hero of Alexandria described a device called an Aeolipile, considered to be the first recorded steam engine. A ball containing water was mounted over a cauldron and, as it heated, two protruding bent tubes shot out jets of steam, causing the ball to spin. Many such devices were conceived in the following centuries as scientists studied the principles of hydraulics, pneumatics, and the properties of gasses, but these devices did not perform real work. It was not until the 18th century in Britain that the steam engine began to change not only the face of industry, but humanity's relationship to work and society. Water is boiled to create steam that pushes upward on a piston in a cylinder. The piston rod is attached to a crossbeam and as the piston rises, the weight of a pump rod hung on the opposite end of the beam pulls downward. When the piston reaches the top of the cylinder, a jet of water is injected into the piston cylinder causing the steam to condense, sucking the piston back down. The cooling water drains out and the cycle repeats indefinitely. 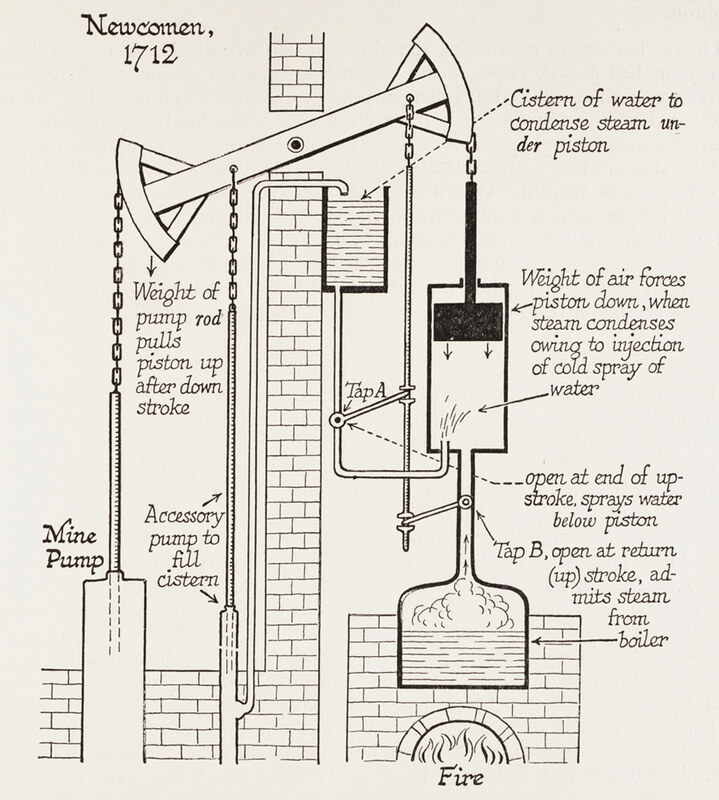 In 1712 , Thomas Newcomen and his assistant John Cally unveiled the first commercially viable steam engine. 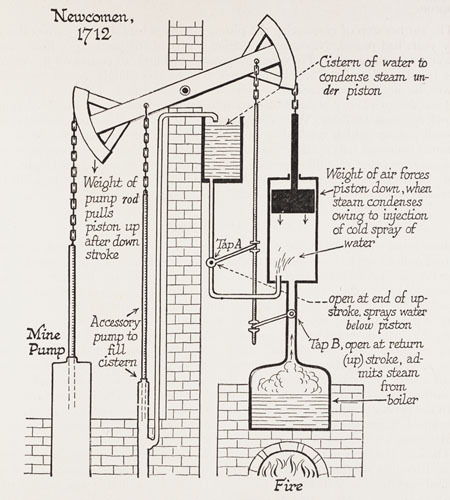 The Newcomen atmospheric engine used steam to power a pump. Though it was not very efficient, hundreds of these engines were used for pumping water from British coal mines and flooded areas. In the late 18th century, James Watt, the man who would eventually be called the father of the steam engine, greatly improved the efficiency of the stationary engine when he patented a "double acting" engine that used high pressure steam on both sides of the piston to double the output. His patents also included such ancillary devices as pressure gauges, throttle valves, and steam regulators. In partnership with manufacturer Matthew Boulton, Watt's improvements and inventions powered the industrial revolution. Following Watt's improvements, many inventors attempted to adapt the steam engine to modes of transport on both land and water. To achieve motive steam power would, for the first time in history, allow man to travel on land at a speed faster than that of the domesticated horse. In 1802, Richard Trevithick patented a "high pressure engine" and created the first steam-powered locomotive engine on rails. Trevithick wrote on February 21, 1804, after the trial of his High Pressure Tram-Engine, that he "carry'd ten tons of Iron, five wagons, and 70 Men...above 9 miles...in 4 hours and 5 Mints." Though a ponderous-sounding journey, it was the first step toward an invention that would utterly change man's relationship to time and space. George Stephenson and his son, Robert, built the first practical steam locomotive. Stephenson built his "travelling engine" in 1814, which was used to haul coal at the Killingworth mine. In 1829, the Stephensons built the famous locomotive Rocket, which used a multi-tube boiler, a practice that continued in successive generations of steam engines. The Rocket won the competition at the Rainhill Trials held to settle the question of whether it was best to move wagons along rails by fixed steam engines using a pulley system or by using locomotive steam engines. The Rocket won the £500 prize with its average speed of 13 miles per hour (without pulling a load, the Rocket attained speeds up to 29 miles per hour), beating out Braithwaite and Erickson's Novelty and Timothy Hackworth's Sans Pareil. The Stephensons incorporated elements into their engines that were used in succeeding generations of steam engines. 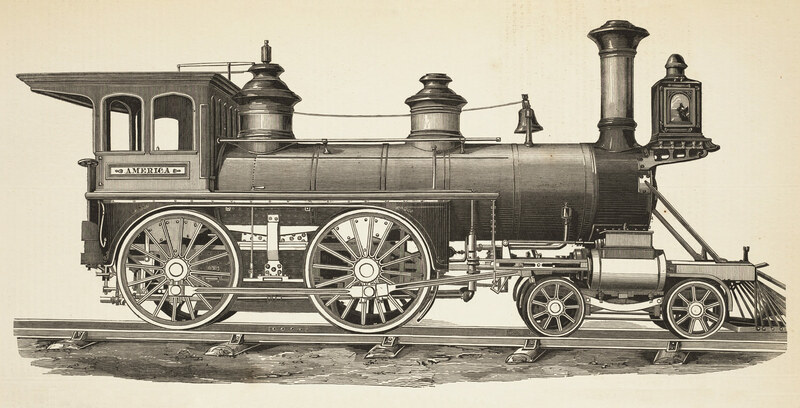 Though the first locomotive to operate on an American railroad was the Stourbridge Lion, built in 1828 and imported from England by Horatio Allen of New York, the British locomotives did not come to dominate American railways because they were too heavy for the relatively light and often uneven American tracks. In fact, the Lion was soon relegated to functioning as a stationary steam engine. 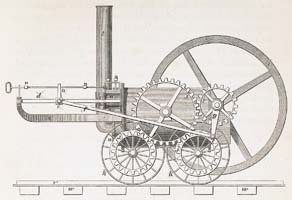 American inventors and engineers had been on a parallel course with the British and, as early as 1812, John Stevens had petitioned Congress to support a national railroad. He had also built the first American steam locomotive in 1825. A multi-tube boiler engine, it ran on a circular demonstration track on his property in Hoboken, New Jersey. Though he was not successful in getting financial support for a national railroad or his locomotive, Stevens later founded one of America's first railroads, the Camden & Amboy Railroad. Peter Cooper's Tom Thumb, built in 1830, was the first American locomotive to pull a passenger car on a railroad. Though small it was powerful enough to convince the directors of the Baltimore and Ohio railroad of the practical application of the steam locomotive. The distinction of being the first to pull a train of cars over an American railroad in regular service goes to the Best Friend of Charleston in 1831. Designed by E. L. Miller and built in New York, the Best Friend operated for nearly six months until its boiler exploded when a worker, who was irritated by the sound of the hissing steam, lashed down a safety valve. The year 1831 also saw Matthias Baldwin establish the Baldwin Locomotive Works. His second steam engine, the E.L. Miller, established the prototype from which later engines developed. By the end of the 19th century, Matthias Baldwin's company became the largest single-plant locomotive builder in the world and dominated the market for over one hundred years, manufacturing approximately 59,000 locomotives. The first locomotives were built with fixed wheels, which worked well on straight tracks but not so well in America's mountainous terrain. 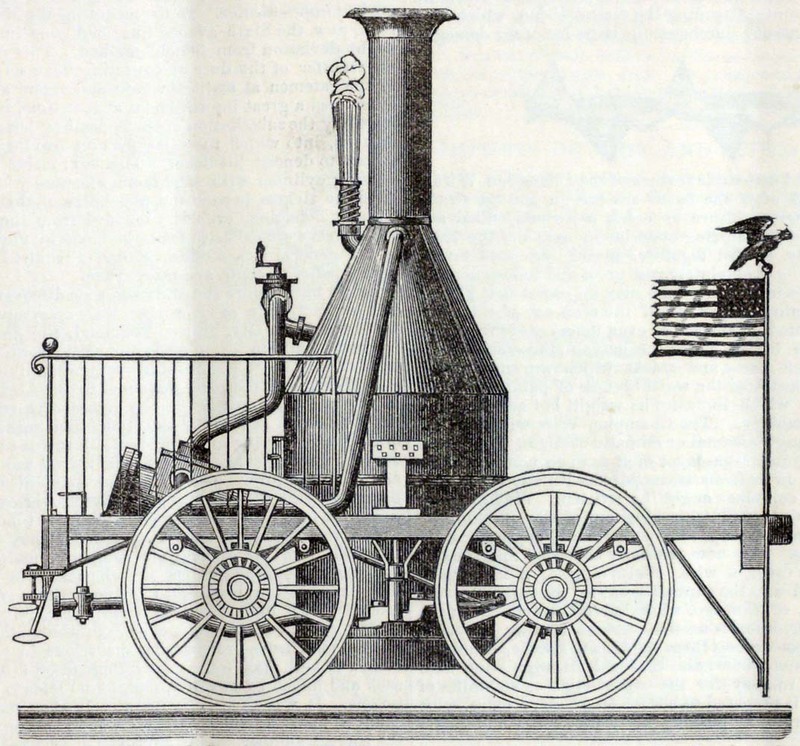 An American civil engineer, John Jervis, designed the locomotive the Experiment in 1832, which had a swiveling four-wheeled guide truck, also known as a "bogie," that could follow the track and enable locomotives to travel on railways with tighter curves. 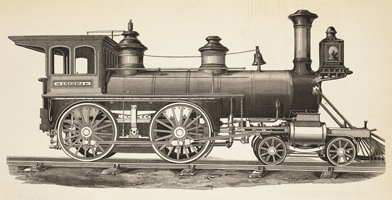 Locomotive America built by the Grant Locomotive Works, of Paterson, N. J., for the 1867 Paris Exposition, a standard American 4-4-0 locomotive of the mid-19th century. The pilot, or "cow catcher," was unique to American locomotives. The rail lines were not fenced and the railroad companies were responsible for any damage done by a collision with an animal, which could derail a locomotive. 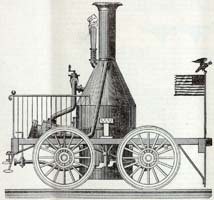 The John Bull, in about 1833, was one of the first locomotives in America to be fitted with such a device to clear obstacles off the track. Soon, pilots became standard appliances for American locomotives. Locomotives could be configured in a number of ways, categorized by the wheel arrangement of the leading truck, driving wheels, and the trailing truck. The 4-4-0 configuration (that is, four wheels on the leading truck and four driving wheels, with no trailing truck), was most commonly used in the U.S and came to be known as the American Standard. The locomotives that met at Promontory Summit, the Central Pacific's Jupiter and the Union Pacific's Engine No. 119, were both 4-4-0 locomotives. American manufacturers produced locomotives equal in capacity to British engines, but at lower cost. Though American engines were elaborately decorated with expensive brass work and labor costs were higher than in Britain, American manufacturers reduced costs by using less expensive cast iron rather than wrought iron for many components. America's railroads began by using locomotives imported from Britain, but by the end of the 19th century, America was a major producer of locomotives and had exported more than 2,900 engines. It is not an exaggeration to say that steam power and locomotives had the same transformative effect in the 19th century that the computer had in the 20th. Robert Thurston, in his 1878 book on the history of the steam engine, said that it would be "superfluous to attempt to enumerate the benefits which it has conferred upon the human race, for such an enumeration would include an addition to every comfort and the creation of almost every luxury that we now enjoy."